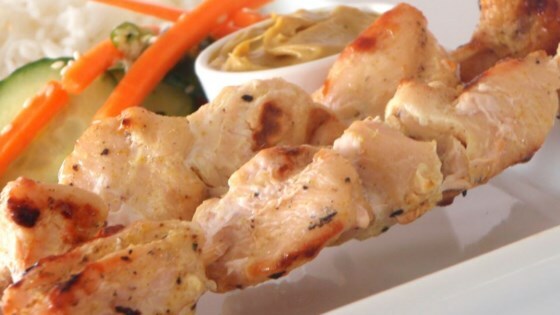 "Savory chicken served on skewers with a slightly sweet peanut sauce." Stir together 1/2 cup coconut milk, garlic, 1 teaspoon curry powder, brown sugar, salt, and pepper until the sugar has dissolved. Toss marinade with the chicken, cover, and marinate for at least 2 hours. Bring 1 cup coconut milk, 1 tablespoon curry powder, peanut butter, chicken stock, and 1/4 cup brown sugar to a simmer in a saucepan over medium-high heat. Simmer for 5 minutes, stirring constantly, until smooth and thickened. Remove from heat and stir in lime juice and soy sauce; season to taste with salt. Thread marinated chicken onto skewers, then grill 4 to 5 minutes per side, or until cooked through. Serve with warm peanut sauce. Fantastic I did add some red pepper to the peanut sauce and some ginger to the marinade. I used the indoor grill, I do think they lost something in appearance but the taste was superb. Super easy and super yummy. Try basting the skewered chicken with some of the peanut sauce while it is grilling and serve the remainder of the sauce at tableside.